For the running geeks out there, I ran this like I do all my runs – with my GPS Forerunner 305 watch and heart rate monitor. I love uploading my runs to motionbased.com as well as looking at them on google maps. I also wear headphones and listen to my iPhone (like my iPod, only i can take pics and view google maps if need be). I must confess my GPS watch said 19.2 miles when i stopped it, but Garmin software on the ol’ computer says 20miles. Breaks down like this – I ran solid the first 7.5 miles to the Beach Chalet, where Golden Gate Park hits the Ocean, and went inside for a drink of water. Then I ran solid up to and through the Presidio to Sports Basement, where i took my second break at 13.4 miles (135 mins), drinking more water and having my only snack, a Cliff Shot of goo. Then I ran through the marina and down Van Ness, at which point traffic, people, and stop lights disrupted my flow. I never realized how much work it takes to run, stop, run, stop, etc. Also had to buy a bottle of water cuz i was so thirsty. I got home and was not tired, but my legs ached, and had a blister on my foot. Not bad. I also give props to eating pasta the night before and no runs for 3 days. Mr. Marathon, I am READY. Today I finally got to use my new gps watch (give it up for no rain). Check out my run from 116 San Jose (home) to Mt. Davidson and back (or all my runs online). Chart details is especially cool – When you click on it, opens a chart with elevation, pace, and heart rate info. Mt. Davidson is the tallest natural point in SF at 925 feet. 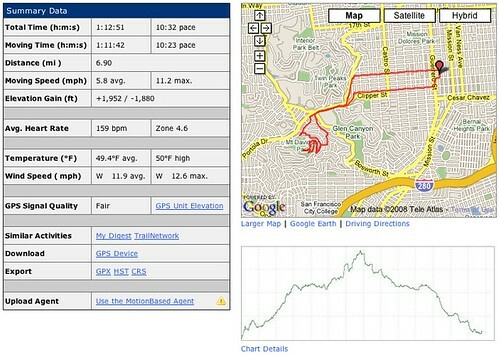 GPS elevation is close, but the elevation gain on the summary data seems way off. Yesterday was the big day. For me, this year’s thanksgiving was especially big, for several reasons. First, i ran my first real race – a half marathon. Second, I got to enjoy the big meal with my family on Tybee Island, a mini-vacation for the 10 of us. And third, after thinking about it, I have much to give thanks for. First lemme tell you about the half marathon. It was the Atlanta Track Club’s Half Maration, starting at 7am on Thanksgiving day (route). I had to get up at 5:15am for that – that’s 2:15am California time – so thats like crazy early for my body. But i did it, and my younger sister Leslie and her husband were there with me. Luckily it wasn’t too cold, but it did rain on us, which sucked. I ended up doing quite well, beating my secret goal of doing it under 2 hours – 1:56 to be exact. Hurray. After the race they gave you a medal, powerade, water, bananas, snickers protein bars, among other things. But the best part is that you burn tons of calories .. so later that day i was super hungry and got to eat enormous amounts of turkey and sides – guilt-free. After the race in Atlanta we drove 4-5 hours down to Tybee Island, which is near Savannah on the coast of Georgia. My sister Lara and her family sold their house in Ohio this summer and moved down here for a year. Just because they want to. My kind of family. The house is gorgeous – 3 bedroom with a deck (and hot tub) with a gorgeous view of the coastal marsh and setting sun. We had alot of traditional items for us Norwoods – Turkey, dressing, stuffing, cranberries, Ham, corn, mac’n’cheese, broccoli cheese casserole, sweet potatoes, rolls, and mixed vegies. Mmmmmmmm…. Most importantly, I give thanks. I am so thankful to have such a good, solid, family. We don’t always get along, but for the most part we are very compatible, and I really enjoy spending time with them. I also have to give thanks for my friends, which are just as important to me as my family. These are the people with whom i spend most of my time – i have fun with them, i learn from them, and i get help from them when needed. I also give thanks for my life so far – the opportunities I’ve had with education, jobs, traveling, and the ability to choose where i live and how i can spend my time. For that i must give thanks to being an American. I truly feel blessed. Amen. I’ve always craved exercise regularly, whether its been mountain biking, backpacking, or dancing all night. But these days i want easy, cheap, regular exercise that doesn’t take too much time – and running fits the bill perfectly. 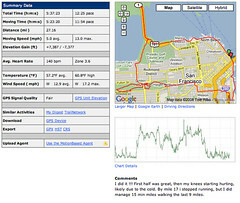 I find myself doing things “runners” do, like checking out running websites, looking for interesting runs around SF, looking for “good” running shoes, and .. yes .. running races. Thanksgiving day, I’m running the 4th largest Half Marathon in the United States in Atlanta with my sister. Hurray. 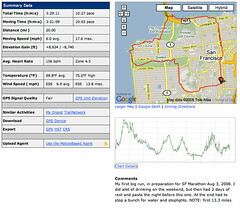 2008 UPDATE – find my runs on motionbased, super easy with new GPS watch. 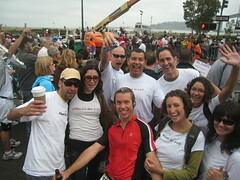 Sun, 12/2/07, I ran a DSE 4 mile run along Embarcadero in 30 mins exactly (7.5 min/mile). Thur, 11/22/07, I ran a Half-marathon in Atlanta (13.1 miles) in 1:55 (115 mins, 8.1 min/mile). Tues, 11/6/07, I ran from 116 to Ocean and back (11 miles) in about 110 mins (8.2 min/mile). Tues, 10/24/07, I ran from 116 to Heron’s Head Park and back (7.3 miles – extra mile in park) in about 70 mins. 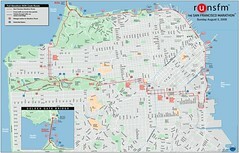 Also, check out the SF bike map – it shows how steep streets are – good for runners and bikes.